Alfie Meadows following surgery. Credit: Justice for Alfie Meadows, Facebook. I want to talk about the personal impact of a serious, prolonged encounter with the criminal justice system, and the collective impact this continues to have on friends and family. Above all, I want to stress that the way in which the state uses time is a method of punishing, even before it seeks to actually penalise you, what I have elsewhere called ‘the weaponisation of time’. The implications for mental health, with the anonymous, seemingly indifferent state with its multiple faces - the police, the prosecutors, the guards - against isolated individuals, named, stripped of any context, are extreme: and it is always the most vulnerable who end up in the worst places, with around 70 per cent of prisoners suffering from two or more mental health disorders. In December 2010, my partner Alfie Meadows was nearly killed by the police when an officer at an anti-tuition fees demo hit him over the head with a truncheon. 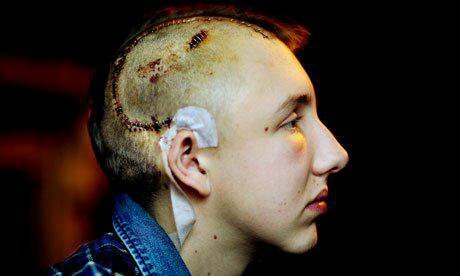 After recovering from the brain surgery that saved his life, he was charged with a serious public order offence. This was despite, or indeed, because of the fact that there was video footage of (and documentation relating to) the attack on him. Police bloggers nevertheless continued to spread disinformation that Alfie had been hurt by another protester, repeatedly claiming that he had been hit by a concrete block. The frustration and anger about not being able to speak out about the truth of the situation online only made the situation more upsetting. Alfie spent the next two-and-a-half years in and out of lawyers’ offices and courtrooms, before finally being acquitted a year ago. Even before charges were brought, several months after he was seriously hurt, I was so viscerally, brutally angry I stopped being able to feel temperature. Months of poor sleep, poor eating and profound rage eventually mutated into something altogether much stranger as I entered into a strange twilight world, lit up by glimpses of things I knew weren’t there but were temporarily convinced were utterly, completely real. Oscillating between panic and guilt because the person who was still recovering from surgery was now having to look after me, it took weeks to get back to some kind of flatter, less jagged space. By the time the charge of 'violent disorder' was announced, when the Crown Prosecution Service had decided Alfie was fit enough to go to court, I was able to handle it calmly and coolly - after all, this is what they do isn’t it? If they don’t kill you they try to blame you for their violence, for playing the role of victim, even. As the trials rolled on - the first ending in a hung jury, the second falling apart after multiple delays and lawyer illnesses - support from friends, whether distant or near, a Facebook message or someone holding your hand in court - became ever more important. By the time of the final day, four weeks into the third trial, it was indispensable. We were all suffering. Seeing the state up close, seeing senior police officers lie and discuss how they would have turned machine guns on protesters, how they had called for rubber bullets, how the students had ‘asked for it’ - was extremely distressing. Where we couldn’t laugh about it we would drink and sink deeper into the horror of it all, repeating silly phrases from court, mocking their ridiculousness. When jury members cried at the footage of protesters being smashed with shields, hit with batons, charged with horses and crushed on Westminster Bridge we cried too, even though we had seen all the footage many times before. By the time of the verdict, we were almost too close to it to feel any relief, even as the political significance of it became increasingly apparent. Alfie and I got sick for weeks afterwards, feverish and full of nightmares. Attempting to chair a conference in a windowless room, I panicked and ran out, being unable to stay anywhere that resembled a courtroom. Only after the verdict was announced did I realise we had already started to see the world as a prison, locked-down, narrowed to a single dot. As this frame gradually lifted away I was left with an immense feeling of gratitude for all the support - from every card someone had sent Alfie in hospital, to every meal that someone had thoughtfully prepared. Time started to unfurl less towards a single, bleak point than towards multiple possibilities, back to life, back to colour. To avoid prison is to be immensely privileged. To avoid prison is to recognise all the factors - most of which have nothing to do with the ‘crime’ alleged to have been committed - that come into play: questions of race, of gender, of educational and class background, of age, of appearance, of the way in which you come across in court, your ‘likeability’ and demeanour. In serious cases, it is to throw yourself on the mercy of the jury, to hope and rely on their inherent humanity and understanding. It is to hang an image of the future on the compassion of strangers. It is a process that sees you repeatedly imagining the moment when they return their verdict and the bluntness of the one or two words that determine your life from that moment on. Never forget, as they will never let you forget, that ‘not guilty’ is not the same as innocent. You are never that. If we managed to survive this ordeal, it was because of the support of people around us. The long-term costs to our collective mental health are still unclear to me: fear of the police is having a debilitating effect on some of those who spent most time at court, or who are very close to Alfie. Protests are always accompanied by a feeling of violent hatred towards the police and fear of the harm they can do. But there were such positive aspects too. Having a politically astute legal team made a massive difference, and Alfie’s own strength of will in the face of his injury and a potentially lengthy prison sentence was incredible: this gentle, lovely, shy person being punished over and over again, just on the off-chance the state could make some pathetic political capital. I still feel, I think, too close to the past few years to properly understand what happened, and what it has cost. At this point I only know that you can’t underestimate what support means in times of crisis, and that we need a more honest and open discussion of the types of psychic damage that the state inflicts upon those who try to question it. When time takes on the form of the enemy, all your thoughts are potential wounds. It is worth remembering that time does not always heal.